A-Rod took some swings in the cage yesterday and reported no pain in his calf. So will he be in the lineup today? No. The answer is no. Girardi said that A-Rod will not be playing until he can prove he can run with no pain. "That's not running, so, I'll see where he's at tomorrow. He felt better today. But he didn't run and obviously that's a concern." My guess is we won't see A-Rod until next week, this weekend at the earliest. With the offensive explosion we have had the past two games A-Rod can take his sweet time. Well, it's started. What's started you ask? The complaining and the doom and gloomers that call themselves Yankee fans, that is what has started. The Yankees are 1-3 in Spring Training and, when you read some the message boards, you'd think they were 10 games out with 9 games to go. Look at the line-ups the Yanks are throwing out there. It's the first week in March for crying out loud. The Yankees are a veteran team and do not need to play everyone all the time. When traveling they don't take but 4 or 5 regulars. And they play 3 innings. Mo won't throw 6 innings in Florida. Girardi won't put his everyday line-up out there until the last week of spring training. So if you really are a true Yankee fan you will believe in Girardi and Cash, trust that A-Rod and Jeter know how to pace themselves and that the rest of the organization is doing the right things. How can't you think that. And they continue to tweak the roster adding Park to the relief corps. So let's all be quiet and let our team do it's thing because you don't think anyone else will ever give the Yankees their due. "The Monkey is Out of the Bottle"
Alex was truly amazing this postseason, it seemed he was knocking home runs and big hits all month. For an awful choker, he seems to have quite a few home runs doesn't he? Even so, he wasn't the Yankees MVP for today, no that goes to Mark Texeira. His four for four today put the Yankees in a position to win and left him only a triple shy of the cycle. Mariano also returned to the Mariano of old with two awesome innings. Again, the problem was the middle relief. The home run Morneau hit off of Coke could have been huge and they almost blew the game. Right now the Yankees are rolling and they need to maintain at least some of this momentum, rather than fall of another cliff. I honestly can't remember the last time a Yankees pitcher threw a complete game shutout. Maybe Mussina did it a couple times. Anyway, Sabathia finally did exactly what the Yankees signed him for. He ended a far to long losing streak with an absolutely dominating performance and gave the bullpen a desperately needed rest. He was in command the entire game and only walked one while striking out eight. 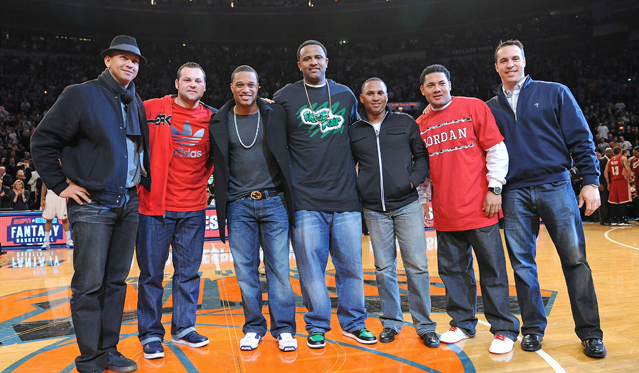 And of course, Alex Rodriguez had to steal the show. In his first at bat back he crushed a ball for a home run to left-field. That gave the Yankees three runs, which was all they needed. Other than that nobody really seemed to stand out, other than the fact that Swisher was definitely not picked off and congratulations to Fransisco Cervelli on a good first game. Major League Baseball is expected to announce Thursday that Los Angeles Dodgers outfielder Manny Ramirez has tested positive for performance-enhancing drugs and will be suspended for 50 games, The Los Angeles Times is reporting. Ramirez's suspension is expected to be announced Thursday, The Times said. Triple-A outfielder Xavier Paul has been told by the Dodgers that he will be promoted later today, according to The Times. In his first full season as a Dodger, Ramirez is batting .348 with six home runs and 20 RBIs. Los Angeles has bolted to a 21-8 record -- best in the majors -- and a 13-0 record at home that set the modern major league record for home winning streak to start a season. UPDATE: Yahoo says that Manny tested positive for a sexual enhancer. Manny did not test positive for a steroid or human growth hormone. Talk of the A-Rod and steroids heated up again yesterday. The Daily News ran an article based on Selena Roberts' new book. The story talks about A-Rod's suspected steroid use in high school. The article said things like Rodriguez 'may have' and 'suspected of'. It used Alex's benching totals from sophmore year as it's main proof. Now to seems to me you don't break a story without any hard evidence, which is exactly what Roberts did. Without any conclusive proof (names, dates, witnesses) these accusations mean nothing. Selena Roberts is just trying to get her book sold. You can do this to almost any Major Leauger. The book also higlights his Hooters tipping habits and "sleezy womanizing". Her book, cleverly titled "A-Rod", is set to drop May 4th. I personally will not be picking this one up. When A-Rod went down we knew the Yankees were going suffer a huge loss. A-Rod's the best or second best third baseman in baseball (David Wright?). Still, nobody expected a line of .180/.226/.320 from Cody Ransom. We also hoped to see at least average fielding. But we didn't get that and after Ransom went down yesterday, their weren't many Yankees fans sweating the loss. A-Rod is making a faster recovery than expected and could be back by early May if he suffers no setbacks. However, they still need to shore up that hole for a few more weeks. Among the candidates are Angel Berroa, Ramiro Pena, and Eric Duncan. First we have the favorite, Ramiro Pena. Pena was a long shot to make the ML roster going into Spring Training. However, he impressed during Spring Training and made the team. Pena's strength is really his glove. He's a fantastic shortstop and the idea of him and Cano up the middle is tantalizing. However, he's definitely not a ML level hitter. He's never even played in AAA and last year had a line of .266/.330/.357. He's not going to hit any better than Ransom. Pena will probably get the job and his defense is a weapon but if he's Derek Jeter's succesor I'd be shocked. Next up is Angel Berroa. Unlike the other two, Berroa has quite a bit of ML experience. His ROTY award in 2003 gave him more second chances than Sidney Ponson. He never followed up on that yera's success and since then has been barely replacement level. He also has next to no experience at third base. He played the position for one third of an inning in 2007 and I assume he tried it out in Spring Training but their's nothing to indicate he'd be a very good third baseman. As a SS he's been slightly below average so I hold little hope for him. The only reason he's getting a look is his hot start in AAA. He's batting .316/.365/.491 so far for Scranton. I have very little hope for him. And finally we reach the Yankees own fallen star, Eric Duncan. Ideally for the Yankees, and Duncan, he would have continued on his path to stardom and given the Yankees a much cheaper, less annoying replacement for Alex Rodriguez when he opted out of his contract. However, things didn't work out like that did they? Instead, he had a few poor, injury plagued years and fell off the map completely. He's now blocked at third base by Mark Teixeira as well. Although he's dabbled in the outfield, his chances of being a Yankees starter are pretty much zero. The Yankees have nothing to lose by giving him a shot and if they can catch lightning in a bottle with him, then he could regain some of his former luster as a trade chip. He's cooled since last we checked in on him but he's still batting .326/.400/.419. I say give him a shot and hope for the best. Simply DFA Ransom to make room for him on the 40 man roster. Duncan, like Pena, has the potential to give the Yankees something. However, theirs none of the risk. The story of Eric Duncan is familiar to most fans by now. The Yankees first round pick a few years ago burst onto the scene as the sole bright spot in the Yankees farm system. He had an incredible year in the Arizona Fall League once and seemed like the Yankees future third baseman. However, the native New Yorker's star has fallen far. He's had a few weak, injury filled years. He's also been bounced around the field. After starting out as a third baseman, he moved to first. Then the word was he was trying out the outfield. He didn't even get an invite to Spring Training this year. He didn't even make most top prospects lists. However, with A-Rod's injury and Teixiera's wrist troubles, their seems to be opening for him. Cody Ransom has been about as bad as you can be as well. Clearly, the Yankees would like a better bat in that spot. Meanwhile, Duncan has been raking in AAA. Granted, its only been 6 games for him but he's hitting .364/.440/.500. Why not try and catch lightning in a bottle for a few weeks with Duncan? If he hits then it would at least boost his trade value. If he doesn't, then they don't lose anything. Its not like Cody Ransom is crushing the ball. Just a wild thought. A-Rod has been placed on the DL. Ramiro Pena beat out Berrora for the utility infielder spot. Stadium Insider gives a great review of the New Stadium (I will post my thoughts later tonight). To amend the obstructed views in the bleachers the Yankees have added some TVs (right).